Within the content marketing space it’s been strongly recommended that you don’t build a home on rented property; and I firmly believe that. But if there are ‘rental properties’ that you need to take advantage of as a business or marketer, they are LinkedIn and Slideshare….and the reasons are many. 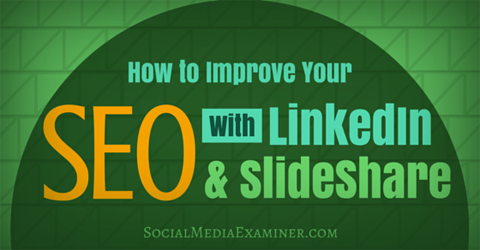 Chris Raulf, Founder and President of Boulder SEO Marketing, a boutique online marketing agency in Colorado, recently published an article on Social Media Examiner titled ‘How to Improve Your SEO With LinkedIn and SlideShare’. And the article is absolutely loaded with great advice. In the article Chris writes about the many advantages of publishing your content on LinkedIn by optimizing your profile and the strategic use of keywords, how Google and other search engines ‘like’ LinkedIn and Slideshare content, the big deal surrounding Showcase pages, LinkedIn groups and much more. It’s all here and it’s today’s featured article on this episode of your ‘A Slice A Day’.